It has been rightly said that you never really play against your opponent. Instead, you play against yourself- your own highest standards and moral values. When you reach your limits that is the real joy. ‘Crime beyond 22 Yards’ is an account on one of the biggest scandals in the game of Cricket. The events date back to the year 2000 when Hansie Cronje was taken in and accused for betting and match-fixing against India. There were plenty other names that became a part of this wrongdoing and in the process, all this sabotaged the healthy spirit in which a game should be played. Written with broad strokes, the facts are redundant. There is nothing new to offer other than a summative analysis of the news reports. However, for an apolitical person like me, who doesn’t know the head or tail of any matter related to politics, this book was surprisingly good. Reading the facts and digging deeper into the problem was interesting. With a subtle cover and a creative title, the book is an average read. Had there been more details, the plot would have passed the muster. 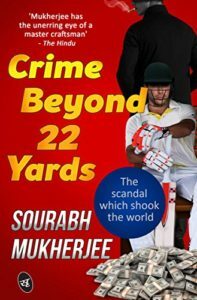 Overall, a light and quick read, ‘Crime beyond 22 Yards’ is a book that can be chosen to obtain one-dimensional knowledge.